1. In a small bowl, mash the raspberries with a spoonful or two of the sugar. 2. In another bowl, stir together the creams and milk, sugar and vanilla. 3. 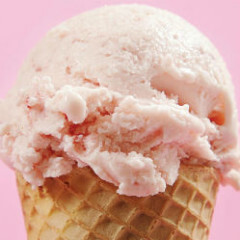 Freeze the cream mixture in an ice cream maker according to the manufacturer’s directions. When it gets thick and is frozen but still soft, pour in the raspberry purée. Let it go until it’s swirly, or wait longer until the whole mixture is pale pink. 4. Serve immediately, or transfer to a container or bowl and put it in the freezer until firm. Makes about 1 litre.